Web-Blink Tool is a Web based Bug/Feedback Reporting Tool and Analytics for Web App. Capture all or part of any web page. Add comments, blur sensitive info, and report with one-click. How to use Web-Blink Tool? Create an account in appOwiz. Just add/attach the script into web and start submitting feedback. Please contact us for more assistance. To see how Web-Blink Tool works; please click here. Can I use Web-Blink Tool in Mobile Web? Yes, You can use! Web-Blink Tool provides Smartphone and Tablet friendly environment. Web-blink works fine with all the leading mobile browsers. You can use all the web-blink features in mobile/tablets which are available in desktop version. How to put comment with Shapes using Web-Blink Tool? There is a unique feature available with the Web-Blink Tool. Select comment box from the Web-Blink Tool and draw the shape. It will allow you to draw the shape with the comment box. Do it and submit. To whom should I contact to use Web-Blink Tool? For any questions, please click here. Which are the unique features in Web-Blink Tool? To read more features, please click here. What is auto capture functionality in Web-Blink Tool? Web-Blink Tool provides a unique facility to auto capture snap, which captures snap after predefined time. That means, you can prepare any action withing stipulated time and then have Web-Blink create a snapshot for you. How can we drag Web-Blink Tool on the screen? Just hold left click on Web-Blink Tool and move it anywhere you want. Web-Blink tool adjusts anywhere in the webpage. How Web-Blink is different from other bug reporting tool in the market? Web-Blink is all-in-one web based Bug/Feedback reporting tool with Analytics and Dashboard. It is too good to report any Bug and sent it to the concerned team. The moment you submit any feedback/bug, Web-Blink provides you a URL to share it with your team and they can instantly take actions on it. Therefore saves time! How to draw a shape on web app / website for Bug/Feedback Reporting? There are multiple options available with the Web-Blink to draw different shapes to report bug for example circle, rectangle, lines etc. You can draw them anywhere on your visible part of screen and submit to web-blink server. How I can user Timer to take snap? Web-blink makes things easy when you want to take snapsho of any hover effects, animations etc using the timer feature! Just click on the timer from the tool and it will automatically take a snapshot after predefined time. Being an App Developer, I have to regularly send the Ad-Hoc bundles to my customers to receive their feedback & we know how tedious and messy the work can get. Hence, I thought to give appOwiz a try. It turned out to be the easiest way to distribute Ad-Hoc OTA by simply uploading the bundle and send invite via email to download the app. appOwiz has ensured that my customers are looking at which bundle to give the feedback which in return, saves my time. We have tried everything. Email, face to face meetings, long phone calls to get our customers' feedback about the mobile apps we are building for them. There used to be that little gap in the communication which led to rework. We came across appOwiz and upon using it, I can confidently say that our accuracy level has been increased extensively. The Visual and Audio Feedback makes sure that there is no communication gap and my customers and my developers stay on the same page. I am not a techy guy who wanted to build my own mobile app. It was way difficult for me to express what exactly I needed or what is not as per my expectations so my app developer asked me to give feedbacks using this great tool called appOwiz and believe me it is so easy because I can literally point out where exactly what I want using its features like write notes, record voice notes, screen capturing etc. 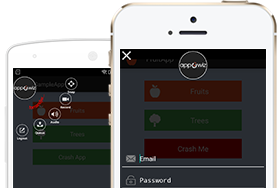 appOwiz ‘s SDK is available in all the 3 major platforms, Andorid, iOS and Windows. By following simple steps you can integrate appOwiz SDK in your app and app user can start submitting bug reports and feedback. © 2019 - appOwiz. All rights reserved.